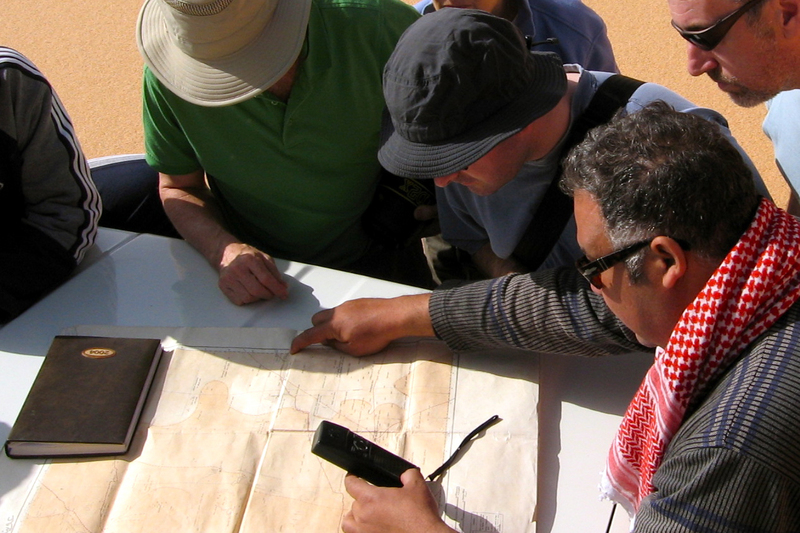 A look at some old Sahara Maps to see what obscure places or routes were once conspicuous, as well as which ancient places survive today. The earliest old map I have looks like it’s from the medieval era, but was probably based on Herodotus’ Histories which was getting on for 2000 years old by this time. It was he that brought terms like ‘Libya’ (North Africa) and ‘Aethiopia’ (sub-Saharan Africa) into common usage. 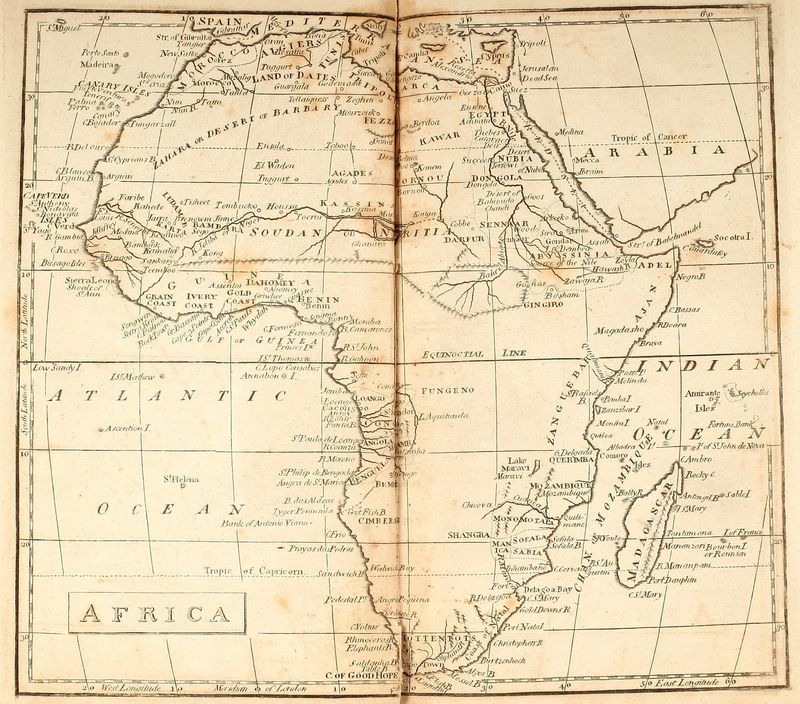 Fast forward a few centuries and there be no dragons or other medieval monsters (right) on this map of Africa dating from an atlas produced in 1803. 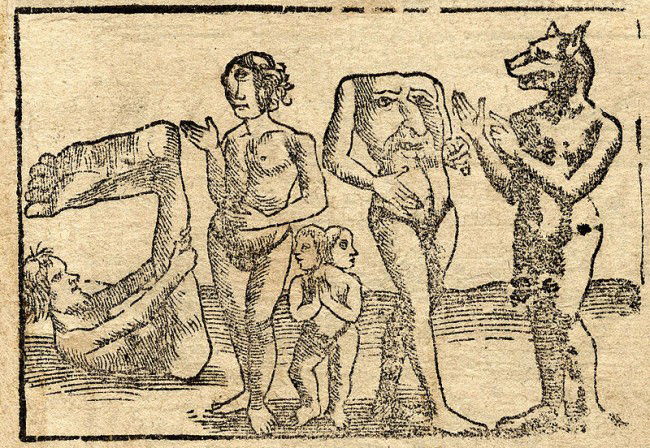 It’s credited to William Kneass who later became Chief Engraver of the U.S. Mint in Philadelphia. 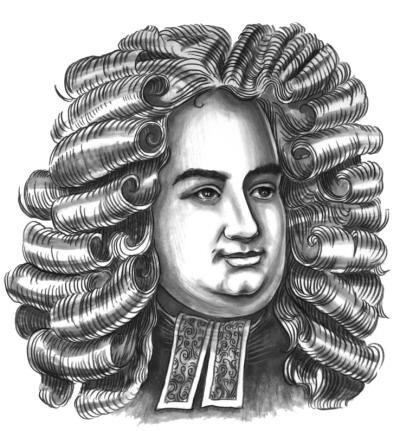 Instead, the advent of scientific enlightenment had brought us longitude, latitude and the ‘Equinoctial Line’. 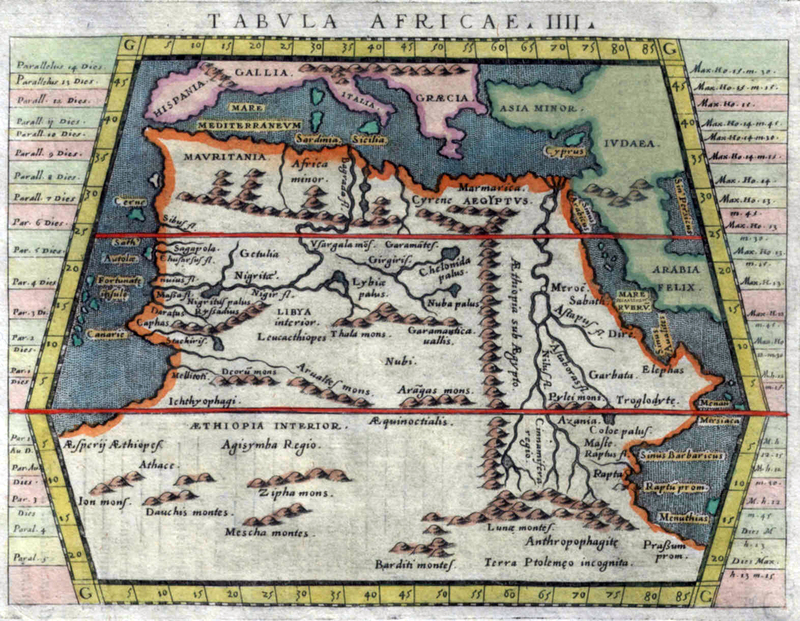 The mariners of the era had succeeded in very accurately mapping the outline of the African continent, but the interior, including the ‘Zahara or Desert of Barbary‘, remained blanks. South of the Sahara the most notable inland incursions were made by the early European colonies around Cape Verde and Guinea Bissau, Angola, the Cape and Mozambique. In the north Egypt and the Nile are better mapped all the way into the Biblical lands of Abyssinia. The Moroccan imperial cities are present: ‘New Salle’ being Rabat, with Marrakech labelled as ‘Morocco’. Never linked those two words before, but presumably they’re both based on ‘Moor’ so it makes sense. South of the Atlas ‘Tatta’ appears to be close to Tata, with the Oued Draa known as the ‘Nun’. The 16th-century Portuguese trading post of ‘Mogodoro’ is Essaouira, and Tarfaya at Cape Bojador was then called ‘Tungarzall’. To the east you’d have thought that Sijilmassa near Erfoud might have got a mention. 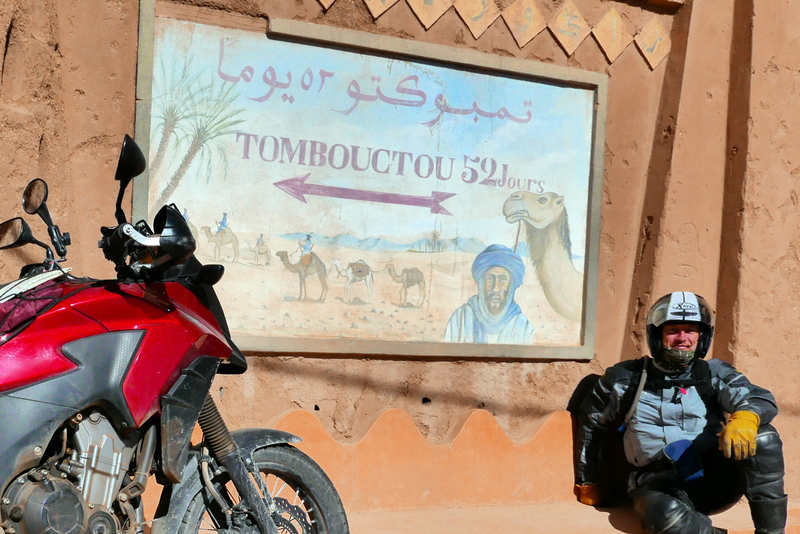 It was the northern terminus on the ’52 day’ caravan route from Timbuktu (left). Further south in Western Sahara and Mauritania, ‘St Cyprian’s Bay’ became Golfe de Cintra after a Portuguese mariner and slaver got killed nearby at Arguin (also labelled). Inland from here, only ancient ‘Tisheet‘ gets a mention, on the old Dhar Tichit caravan route. I remember going to a talk in Nouakchott about the medieval glass trading links between Tichit and Venice. Tichit didn’t look like much when we were there in 1990 (right; it’s all in D. Travels), but it’s a historic settlement on a par with Timbuktu (left; as seen by Caillé in 1830), Oualata, Chinguetti and Ouadane. The latter may be the ‘El Waden’, misplaced way north of Timbuktu and not far from ‘Ensala’ which could be even more distant In Salah in Algeria. At this point it was still a couple of years before the American sailor, Robert Adams briefly ended up a slave in Timbuktu. 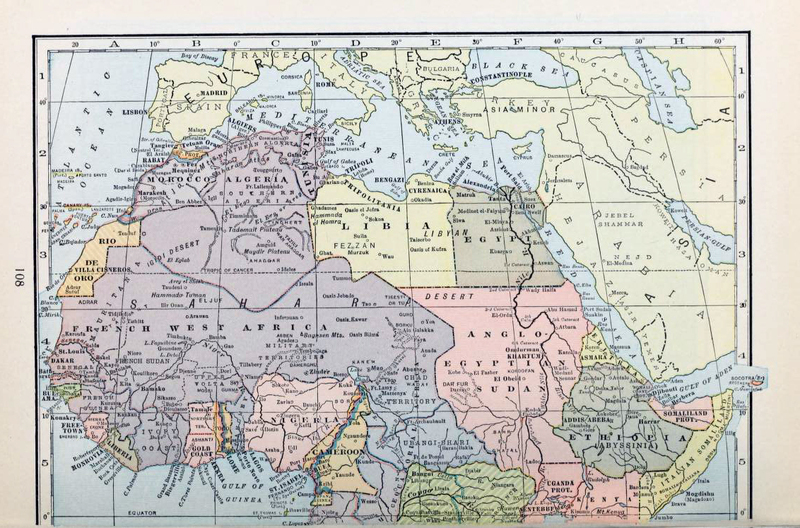 Among other things, his account helped kick off the race to reach this fabled Saharan ‘Shangri La’ and with that, the great age of European Saharan exploration as listed rather Francocentrically on the 1898 map below. Eastwards on this 1803 map, many places in Algeria are recognisable: ‘Tuggurt’, ‘Guargala’, and over the border in present day Libya: ‘Godemashe’, ‘Mourzouk’ and ‘Ganat’. ‘Zeghen’ was less easy to pinpoint, visited by James Richardson while on the road from Tunis to Ghat and back up to Tripoli in 1845-6. At the time Richardson estimated Zeghen’s population at ‘200 men, 300 women, and 700 children and slaves‘. 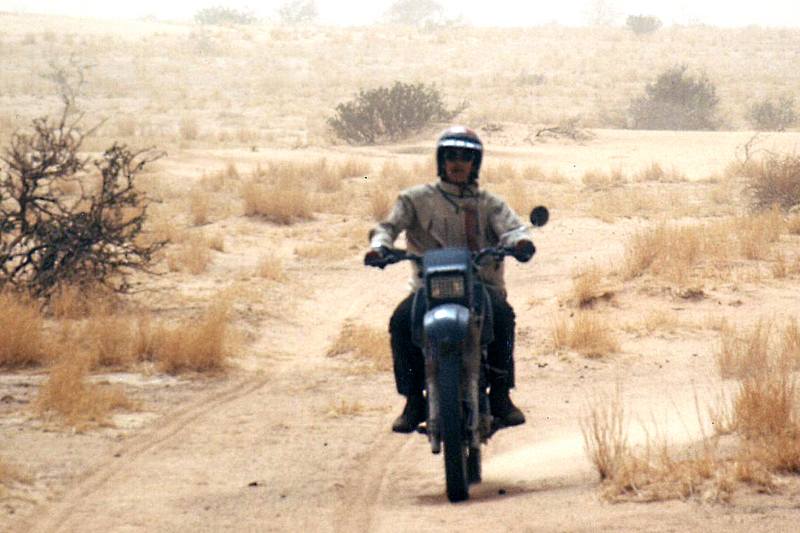 Our man Duveyrier (see below) locates it for us a short distance northwest of Sebha in the Wadi Ash-Shati, on the way to ‘Sockna‘. 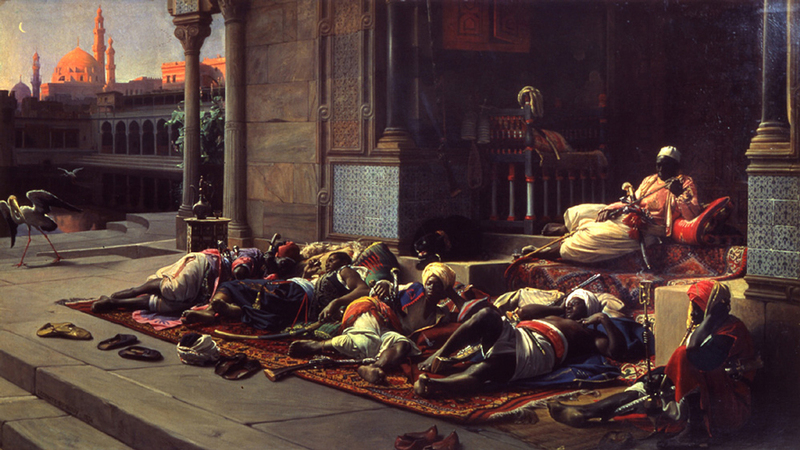 Here Richardson spent some time as a guest of the Turkish Caid and his comely concubines. 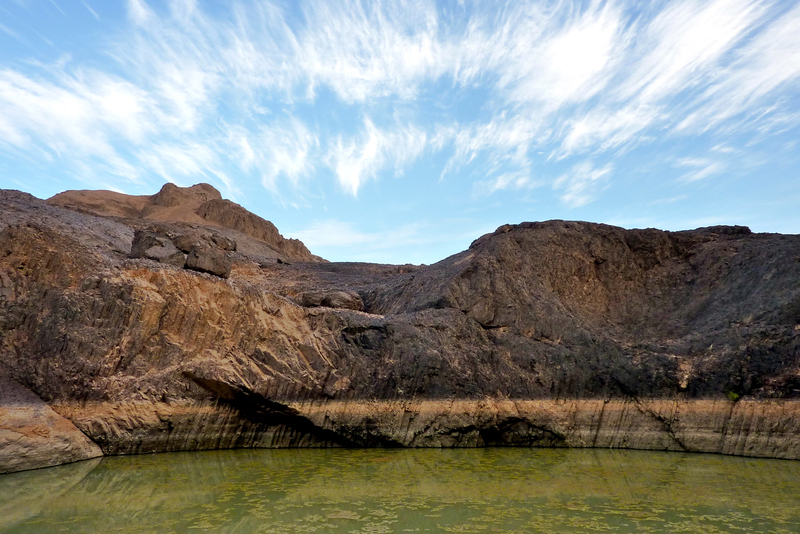 ‘ Berdoa’ is the old name for Kufra in southeast Libya, and south of there, on the page’s fold, is the enduring salt oasis of ‘Belma’ (left) at the base of Niger’s ‘Kawar’ escarpment. 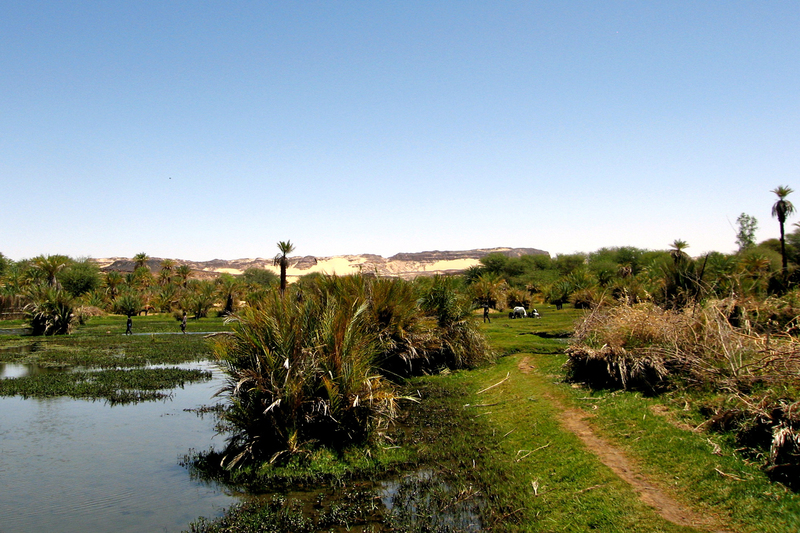 The hyper-arid and largely uninhabited Libyan Desert around Jebel Uweinat wasn’t to be explored until the 20th century. Fast forward a hundred and one years and the Saharan blanks begin to fill up. 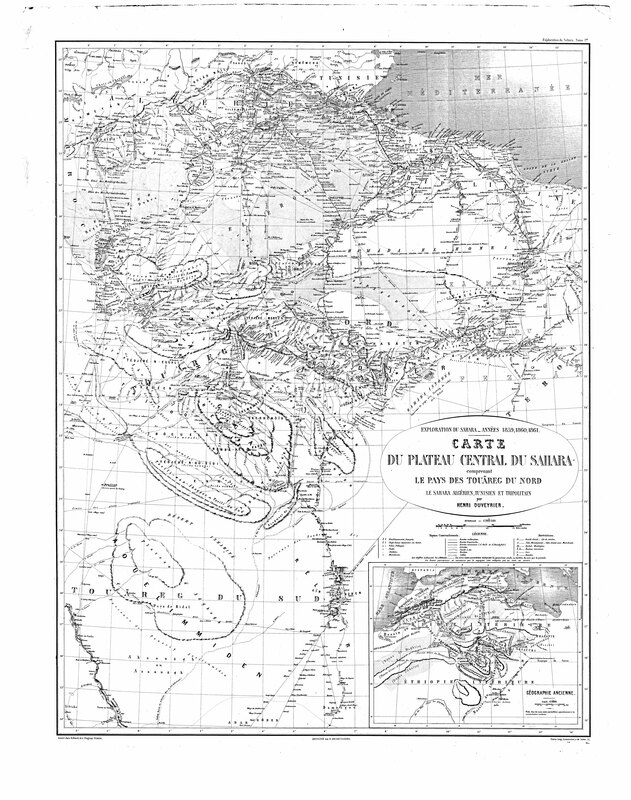 Below is the ‘Northern Africa’ plate extracted from a Bartholomew’s Handy Reference Atlas of the World dated 1904 (source) and which differs very little from my 1888 version. The interior is still sparse, but the proposed trans-Saharan railway gets a mention. Running across the flat plain of the Tanezrouft, in 1922 it was the actual route taken by the first cars – Citroen Kegresse autochenilles (half tracks; left) – to cross the Sahara north to south and back. In the west ‘Shinghit’ is a bit out of line with Atar and Wadan, but in the ball park. 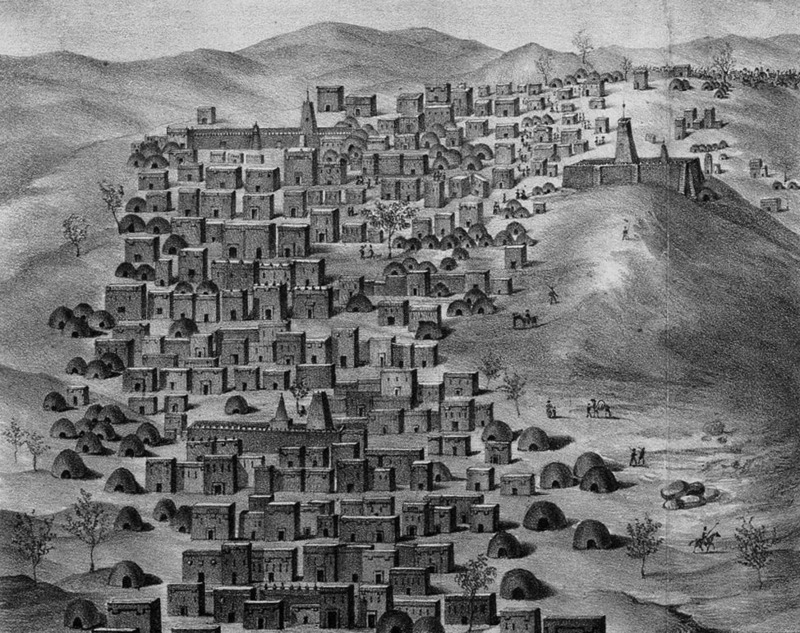 To the south is the ghost town of Ksar el Barka and ‘Portendik’ must be early Nouakchott, though you wonder what became of ‘Mufga’ near grubby Choum of today. Ancient Taghaza (as visited by Ibn Battuta) never gets a mention on any of these maps, but it’s replacement, the newer salt mine at ‘Towdeni’ was a key point on the ’52 days’ caravan route to Sijilmassa. In northern Mali, ‘Essuk‘ whch hosted the early Tuareg music festivals before they moved to Timbuktu and long predates today’s Kidal. Meanwhile in Algeria the Amadror salt mines get one of their last calls. Wau crater in Libya gets a name check too, there’s brackish water there, but due to the mosquitoes it was never a settlement. Up in the Mediterranean, Crete is oddly identified by its ancient name of Candia, perhaps intended as a poke at the despicable Ottomans? Left we have Dufrenoy’s intriguing and detailed map from 1898, centred on the southern limits of French-controlled Algeria. The red lines identify the itineraries of that busy century’s wave of Sahara explorers, from Laing’s fatal excursion to Timbuktu in 1826, right up to Laperrine, who in 1898 set out to quell the southern Tuareg with his Méhariste Camel Corps and died in a plane crash southwest of Tam in 1920. 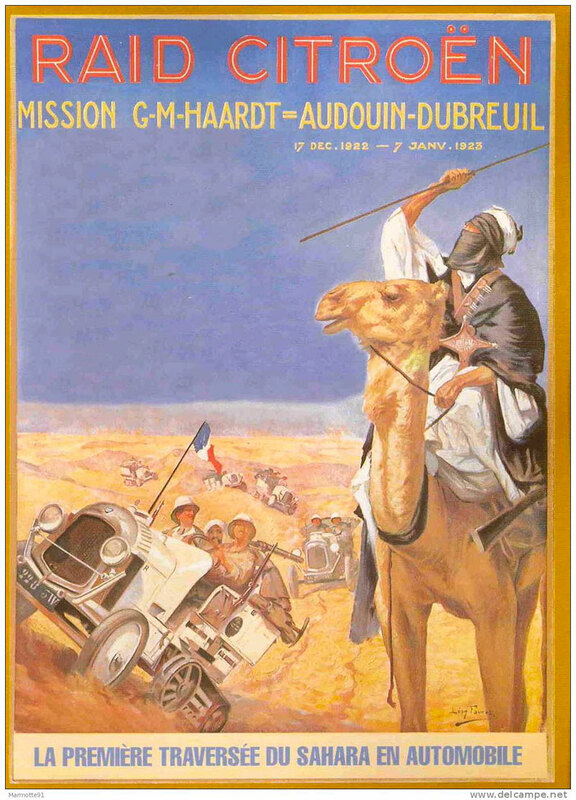 Note too the zig-zaging return of Flatters’ disastrous second mission of 1881, (as described in Desert Travels) when the handful of harried survivors sought to out-run the Tuareg who’d trailed and picked them off one by one. 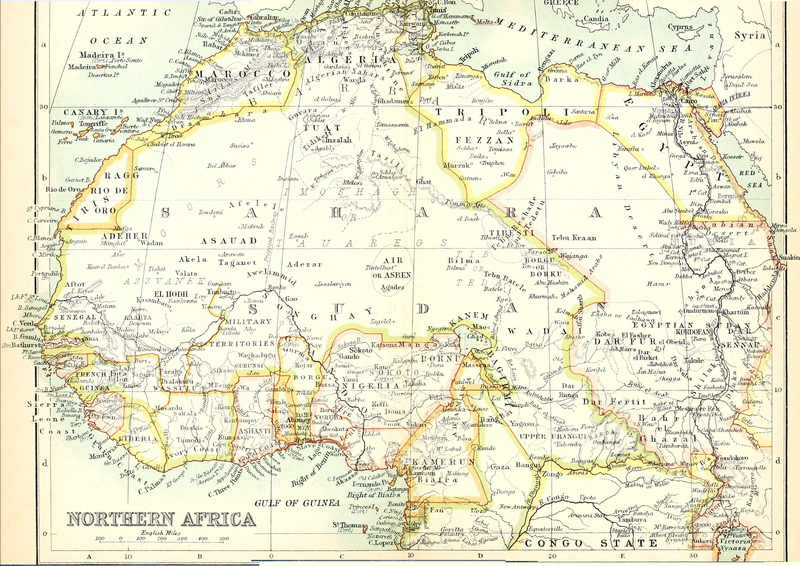 Back-tracking a bit, the 1881 Flatters Mission – partly intent on reconnoitring a railway route between the Maghreb and France’s territories in West Africa – wouldn’t have got half as far as it did without Henri Duveyrier’s amazingly detailed map of 1864. 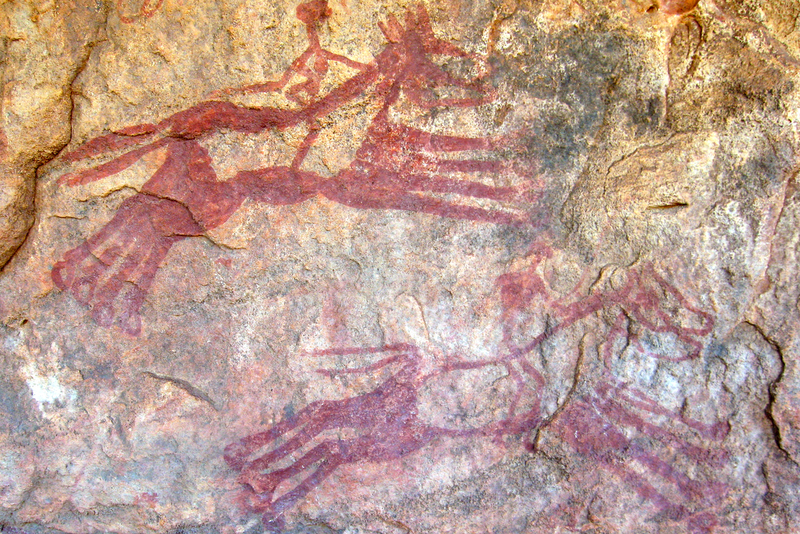 It was based on his journeys there a few years earlier, described in Les Touaregs du Nord. 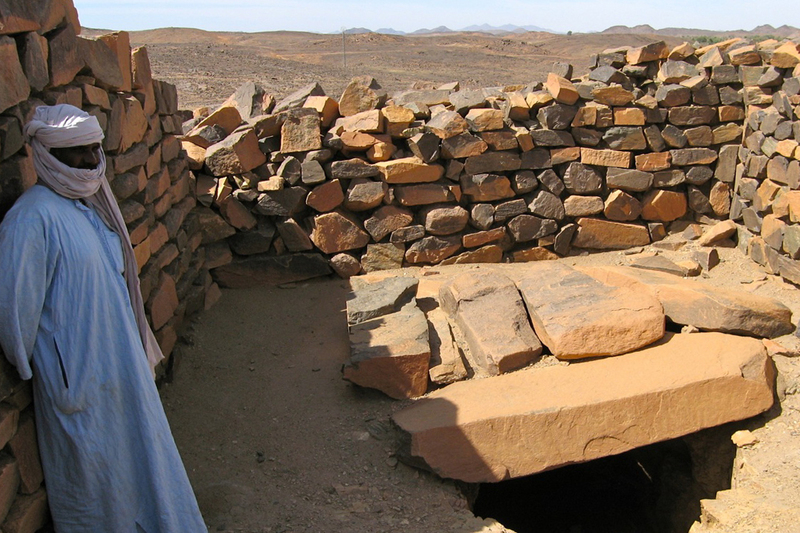 Tamanrasset was merely a oued; Silet, In Amguel and Ideles on the other side of the Hoggar were established settlements. The tomb of Tin Hinan (right) even gets a mention, though it’s a bit misplaced from actual Abalessa. 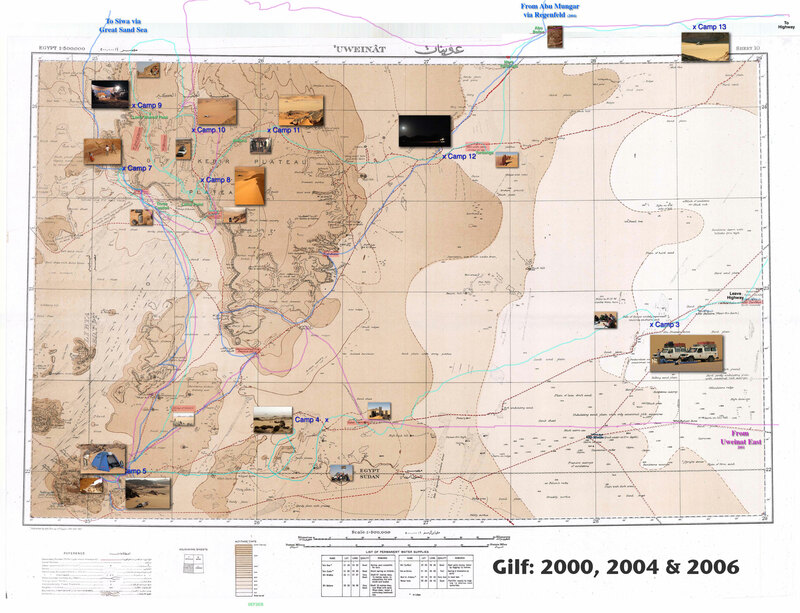 Further out on the Tanezrouft the strategic well of Tim Missao (the chariots, above) and the waterhole at In Ziza (right) are labelled, but in Libya the Murzuk sand sea is just an ‘unnamed hammada’ separating the Tuareg from Tubu. There’s plenty more mouth-watering detail if this area means anything to you, and Duveyrier’s inset helpfully lays the ancient geographical names alongside their modern counterparts. How time flies. It’s now 1933 and France’s African colony encompasses half the Sahara and most of West Africa. 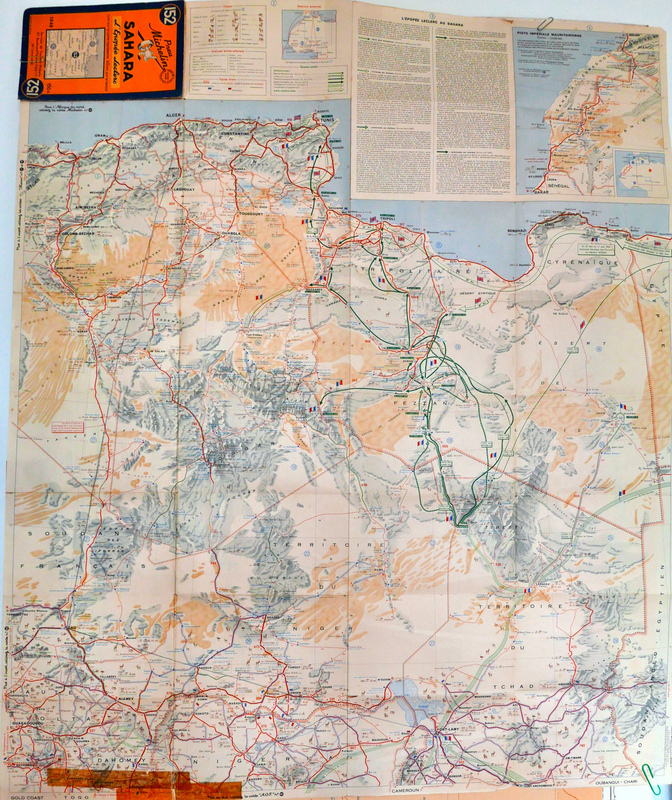 Tamanrasset and Djanet, which even then must have been the biggest towns in southern Algeria, are still missed out, but then this isn’t a French map. In Mauritania Tidjikja makes an appearance, so does Iferouane in the Aïr and Tindouf up in Algeria. ‘Marakesh’ looks like it’s still ‘aka Morocco’ where the Spanish cling on to protectorates in western Sahara (Rio de Oro), Sidi Ifni and on the north coast, but not for long. Within 25 years the Sahara would take on the borders and principal towns with which we’re familiar today. 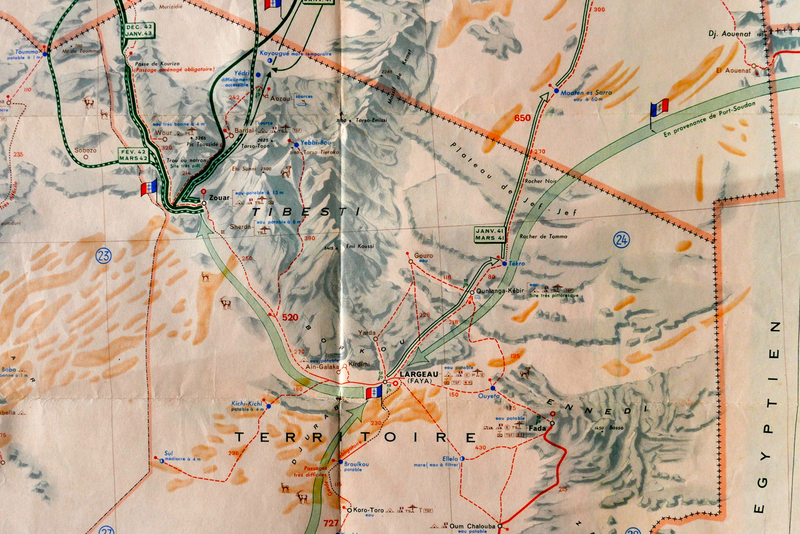 Who can resist the superb ‘Uweinat’ map originally published by the Survey of Egypt in 1945. One of the most fascinating corners of the Sahara, much of its detail was based on the intrepid explorations of Ralph Bagnold in the 1920s, as well as later Brits, some of who were fictionalised in The English Patient movie. The last time we travelled there, it was still the best paper map available for that area (right), notwithstanding the newer aeronautical TPCs. 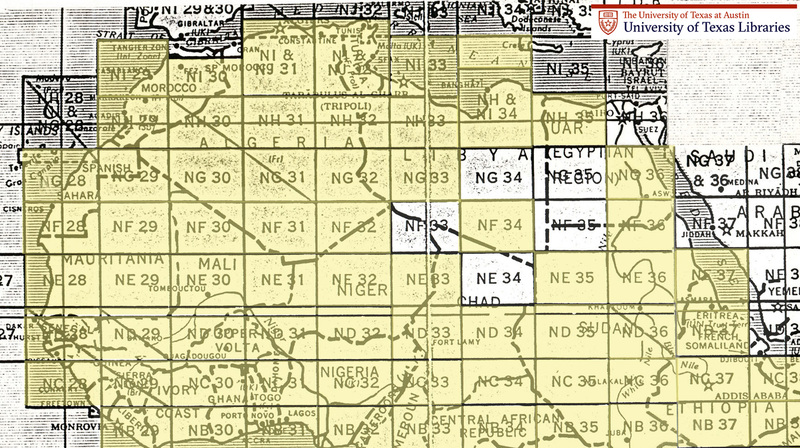 Old Saharan mapoholics will be familiar with the Austin TX university’s comprehensive online database of full-sized Saharan maps dating more or less from the early 1940s. Click this to get to the index pictured below and thank you Austin. And finally, a forerunner to the famous 4-million scale Michelin 153 map (now the 741) that covered the French Sahara: an ageing Michelin 152 from 1948. It was the best photo I could manage – scanning will have to wait for a very rainy day. You get the feeling that this may have been a commemorative special edition to celebrate General Leclrec’s heroic achievements in the Sahara during WWII, when a small column managed to take Kufra and then Murzuk from the Italians, and then push north to help expel the Axis forces from North Africa along with the 8th Army. Like the LRDG map, the 152 has helpful detail like ‘piste tres difficile‘ as well as the famous info on water resources ‘tres mauvais a 50m‘, that we recognise from the later editions which covered the Sahara all the way to the Atlantic. Too much information? Then this may interest you. Want modern maps? Go here. 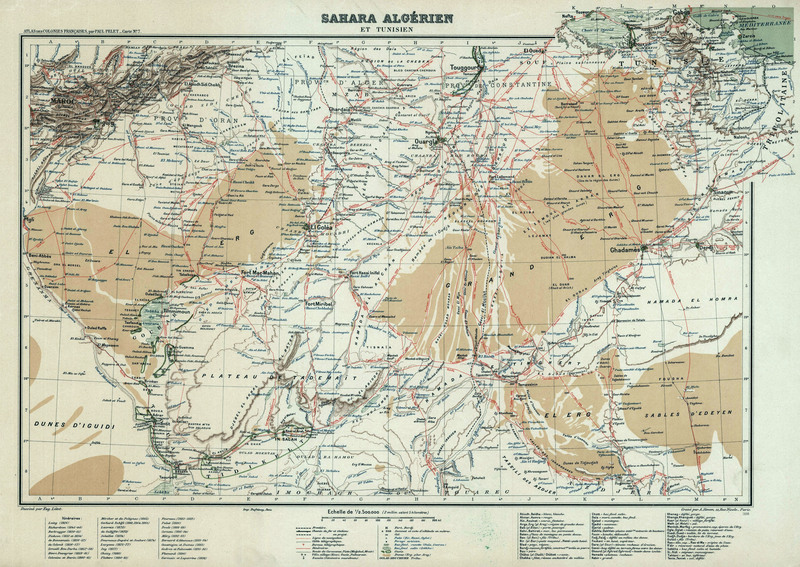 This entry was posted in Maps, Sahara A to Z..., Sahara News and tagged Berdoa, Dufrenoy Sahara map 1898, Henri Duveyrier Sahara map 1864, in ziza, Michelin 152, old sahara maps, Sahara 1904 map, Sahara Map 1888, Sahara maps, timbuktu 52 days, tomb of tin hinan, Vintage Sahara maps, Zahara or Desert of Barbary on June 18, 2016 by Chris S.